The right ring size is an essential must for the most special moment. The ring needs to be tight enough not to fall off, but it also has to be loose enough to slide over your knuckle. The time of the day and also the weather affect the measurement. Because in the early morning or cold weather, fingers are smaller and when the weather is too hot, the fingers are bigger. The evening is the best time to measure your finger size while they are warm. If you hesitate between two sizes, always go with the larger one. If your knuckle is larger than the base of your finger, measure both your knuckle and the base of your finger and select a size in between the two.It is always good to measure your finger a couple of times during the day. If the ring is going to be a surprise, you can ask her / his friend or family members or you can secretly borrow her/his ring and go down to a jeweler to learn the size. Please also remember that right hand and left hand are different so the finger sizes are different too. We understand that it might be difficult to accurately select the correct ring size online, and especially if it is intended to be given as a surprise gift, you would have to guess the ring size. Ring sizer is a tool to find out your ring size. We always encourage our customers to take advantage of this opportunity that we offer, considering that the sizer itself and the shipping is free and this is the most accurate way to find your ring size. To claim your free ring sizer you can either send us an email at service@glamira.com.mt including your name and your address with a subject "Order a ring sizer", or you can fill in this form. Once the form is filled, it might take up to 7 business days for your free ring sizer to be delivered to your address. 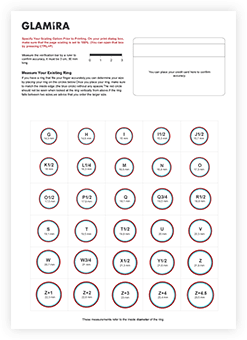 In case of the occasion being just around the corner, you can also download free ring sizer in PDF format which comes along with instructions. Download the free ring sizer in PDF format here. 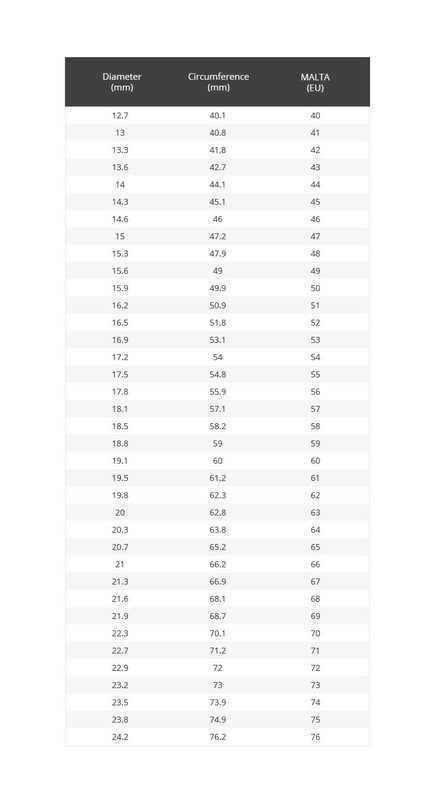 Temperature causes an inaccurate reading while measuring your ring size. Your fingers will be at least half a size smaller when your hand is too cold while it will be half a size bigger when it is too hot. Measure your finger in average temperatures, preferably at the end of the day when your fingers are at their largest. The wider band a ring has, the tighter you will feel. So, if you wish to order a band approximately 6 mm wide or more , move up a size from the normal ring size worn. Also, the rings with large stones may cause the band to lift up when laid on its side. Keep in mind that you should order the next size up since it slightly distorts the size. If your knuckle is larger than the base of your finger, measure both your knuckle and the base of your finger and select the size in between two. Your ring should snug enough not to fall off and loose enough to slide over your knuckle. If you hesitate between two sizes, always go with the larger one. Repeat measurement 3 to 4 times to eliminate an erroneous result. Please avoid getting your item resized by a third party such as another jeweler or someone other than GLAMIRA as it will void your lifetime warranty. Please note that the resizing process may take up to 25 business days depending on the product and the resized ring will not be eligible for a refund. Below you can find the standard ring sizes along with the corresponding diameters and circumferences.